A number of large European corporations have sizable cash positions, a similar trend to what's been happening in the US. In the past these corporations would simply deposit that cash in their local eurozone banks. But these days the companies are much more cautious with their cash. Some corporations have bank subsidiaries (for example Nestle owns Nestle Bank), a practice generally illegal in the US, but common in Europe. 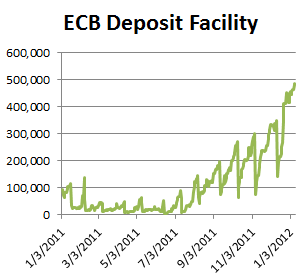 They use their "internal" banks to deposit funds with the central bank to avoid credit risk, contributing to this rapid rise in the ECB Deposit Facility balances. Corporations that do not have a bank subsidiary do not want to leave unsecured deposits at the banks, so they revert to lending to banks on a secured basis via repo. Reuters: ... a group of well-known, cash-rich companies with solid cash flows has stepped in the repo market, which provides a form of lending so far almost exclusively in use between banks, and between banks and central banks. To obtain additional protections on these loans, the collateral is often held by third parties in a so-called triparty repo. Reuters: Based on his daily practice, Euroclear's Reiss estimated that up to 25 percent of the triparty market was on behalf of companies, a massive and sudden rise from the 2 to 5 percent where it had traditionally been. To accommodate their corporate clients, banks need collateral to post on these repo transactions. 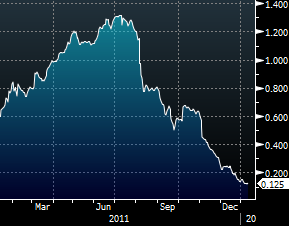 And that is putting additional strain on collateral availability and helping to drive down repo rates in the eurozone.